Space has been always been a frightening and yet at the same time an irresistible lure for humans. Billions of dollars have been spent on space exploration; numerous missions have left the Earth heading towards stars in the unknown void. The latest ambition is exploration and colonization of Mars. Will it ever be possible? Is it worth the risk and effort? Today we talk to an aerospace engineer and outspoken advocate of a human mission to the Red Planet. Sophie Shevardnadze:Our guest today is Robert Zubrin, aerospace engineer, author and very outspoken advocate of human colonization of Mars. It’s great to have you here on RT, Robert. Robert Zubrin: Thanks for inviting me. SS:So, people haven’t been to the Moon for the past 40 years and the last time they went there the lunar expedition didn’t really have consequences, didn’t really bring much effect. Why, do you think that Mars will actually have more effect? RZ: Well, Mars is a much more interesting place than the Moon. The Moon is a rock, Mars is a world. Mars had oceans on it in the past; it had rivers that are dried up now. But mars had liquid water on it for billion years which is five times as long as it took for life to appear on Earth after there was liquid water here. So, it’s possible that life could have evolved on Mars. And if we could go to Mars and find traces of past life or even surviving present life it would prove that the development of life from chemistry is a general phenomenon in the universe. And furthermore, Mars is a planet that has the resources not just to support life but technological civilization. For our generation, Mars is the New World. SS:But from what we know right now - you can’t breathe on Mars because there is no atmosphere, right? There are sand storms. I mean, the place is pretty inhospitable. RZ: Right, what I’m saying is to humans as they were originally most of the Earth was uninhabitable; we became a global species by inventing the technology that allows to live in Eurasia and North America, and many other places that we were not originally designed for. We are tropical animals; we have long thin arms with no fur. We became a global species by inventing technologies; we can become a space-faring species with numerous planets open to us by inventing new technologies. SS:Do you believe there was life on Mars before? RZ: I actually believe there probably was, although it’s not proven. Ok, that’s the point. We want to go to Mars to settle this issue. If life could evolve on Mars, and we know, of course, it has evolved on Earth, if it evolved separately on two separate planets, that means that the development of life from chemicals is a probable process. And since we now know that the universe is filled with planets, that most stars have planets, if life could appear wherever there’s a planet, it means life is everywhere. Since the whole history of life on the Earth…this is one of development from simple forms to more complex forms, manifesting greater capacities for activity, intelligence and ever more rapid evolution. If life is everywhere, it means intelligence is everywhere, it means we’re living in a living Universe. On the other hand, if Mars really had oceans and all this stuff for billions of years, but life never appeared there, it could mean that development of life on the Earth was a matter of freak chance and that life is a very improbable thing, and we could be alone in the universe. So, what we are going to discover by going to Mars is whether the universe is living or dead. This is something that thinking men and women have wondered about for thousands of years. SS:What I’m saying is that all the information we have from Mars so far is the information from robots that we sent to Mars. We’ve never actually got anything back from Mars, we haven’t touched anything from Mars. Wouldn’t it be more logical to get something back before we send humans to Mars? RZ: Well, we sent humans to the Moon before we got anything back. Soviets did do a sample return from the Moon but that was after the Apollo astronauts had gone to the Moon, and the Apollo astronauts, of course, brought back plenty of samples as well. There are some people who want to do a Mars sample return, there is a mission that is in planning at NASA to return a few kilograms from Mars. But, that is not a necessary step before we send humans to Mars. I think, frankly, humans could do that mission much better: instead of bringing back two kilograms we can bring back two hundred kilograms, and they wouldn’t just be chosen from a few places that a robot could go, but they would be chosen by humans who have been staying on Mars for years, exploring all over the place and choosing two hundred kilograms of the best samples out of thousands that they would have a chance to examine while they are on Mars. SS:When we talk about colonization of Mars, are we talking about sending someone to Mars who is not going to come back, they are just going to stay there forever. Or are we talking about a sample trip – someone is going back and forth in the first. I know it takes five hundred days to get to Mars, right? RZ: No, it only takes 190 days to get to Mars, and then you would be on Mars for 500 days and another 190 days back. I think most people want to do exploration missions that are round trip missions before we do one-way missions. There are some that are proposing to go to Mars one-way right from the beginning - that is a settlement mission. In my view, and that of most people, but not all, exploration precedes settlement. So, initial missions will probably be round trip missions of the kind I described. But at a certain point people are going to want to go to Mars to stay and that is a one-way mission. Life is a one-way mission. SS:What’s the time we are talking about? Because we’re talking about ‘going to Mars and staying there forever’. Are we talking about hundreds of years, fifty years, ten years, twenty years. Give me a guess. RZ: From a technical point of view we are much better prepared today to send humans to Mars then we were to send man to the Moon in 1961. RZ: The question of when we will go to Mars is a political question. It’s a question of when a decision will be made to do it. I think we should make such a decision, we should make it now. Ok, we went to the Moon and we haven’t gone back in 40 years, we haven’t gone beyond lower Earth orbit for 40 years. The American Space Program needs this goal, the world’s space program needs a goal. We shouldn’t just be sending people into space to go up and down to the space station, up and down forever. We’ve done over 300 missions to lower Earth orbit. What’s the point? The purpose of going to space is not just to hang out, it is to go across space and explore, and settle the worlds on the other side of space. This is the goal for our time. What humans to the Moon was in 1960s, humans to Mars is today; this is the challenge for our time and I think we can do it. I think it would be a good way to bring the world together; in particular I’d like to see a joint US-Russian mission to Mars. SS:Before we get there, when you say there needs to be a political decision, who exactly needs to decide on that? Is that all about the money? RZ: Well, yes. It’s about committing the resources to do it and committing the prestige, accepting the risks they are involved in doing such a program. It’s one thing to run a space program, saying we’re going to avoid risk, we’re just going to do things we have done before. But this is not a way to do great things. SS:Can I? ….A follow up question. Are we running more risks now sending people to Mars than we were when we were sending people to the Moon? Or it’s about the same? RZ: I would say it’s a lower risk. We certainly know much more about Mars than they knew about the Moon. We know much more about space flight than they knew. I mean, look, when Kennedy committed us to go to the moon, ok, Gagarin had orbited the Earth once, the United States hadn’t even orbited the Earth – we had gone to sub-orbital flight, 15 minutes in space. We didn’t even know if people could eat in space when we decided to go to the Moon. You know, when you embark on such a venture there are unknown questions. But you have to have the confidence you are going to be off to solve them along the way, you are going to be out to succeed. You know, for people to say right now that going to Mars is too formidable, would really be saying ‘we become less of a kind of people we used to be, less of a kind of people who could take on new challenges’. It’s a new challenge, but challenges are valuable. Nations are like people, we’re growing with challenge, we stagnate when we’re not. I think a humans-to-Mars program will be a tremendous positive challenge for every country participating in it. Every country that is participating in it would encourage millions of young people to go into science, because youth loves adventure. This would make science the great adventure. SS:So, if you are saying that we were running more risks when we were sending humans to the Moon, than we’re running now sending them to the Mars, I guess the stumbling point is the money. How much will it cost for something like that to bring someone there for 500 days and then back? RZ: Ok, if you did this, within an efficient program, one that was designed to get the job done, not one that was designed to just go on forever so people could stay on a payroll. There are both kinds of programs that we see in the space world. I think that we could develop the hardware we need to go to Mars for about 20 billion dollars and then each mission would cost perhaps between 1 or two billion dollars, once you’ve had the hardware. To give you a sense of what that means in American terms anyway, our space budget is 16 billion a year. If we develop the hardware over ten years, 20 billion divided by 10 is 2 billion a year; that’s about 14% of NASA’s budget. Ok, and then two billion a year is 1/8 of NASA’s budget to carry it on. SS:Why is NASA being so reluctant? RZ: I think they’re reluctant to embrace risk - the current leadership - and I think the political class has been reluctant to embrace risk. But embracing risk is necessary, we wouldn’t be where we are today if people who had gone before us hadn’t taken risks: Columbus took risks, Lewis and Clark took risks, we took risks when we went to the moon. Nothing great has ever been accomplished without risk, so we need to take this on. SS:Life on Mars: first of all, what are you going to eat there? RZ: Well, the initial explorers will bring their food. RZ: Well, two and a half years is the round-trip, six months to get to Mars, six months back. There’ll be dehydrated food like pasta and flour, and rice and so forth. The reason why you’d want to bring the dehydrated food is because you can recycle water, and so, for instance, a pound of spaghetti makes a whole meal for four people but it’s relatively like weight itself and we’ll have systems for recycling the water, we know how to do this. RZ: Well, we’ll bring a certain amount of water, we’re going to recycle it, there are systems right now that we can recycle water with 90 percent efficiency. But now, in fact, we’ve discovered that there is water on Mars, even at the equator the soil is 5 percent water. If you go further north or south it gets more – up to 60 percent near the poles, and there is even ice. SS:So water is the new oil on Mars, right? RZ: Well, water is the stuff of life. I mean, water is more basic than oil in terms of what we need. And the fact that there is water on Mars will help us broaden the water supply, we’ll be able to use water, more copiously instead of having to do a sponge bath every other day, you can have a shower every day if you can get water from Mars. So, that’s a good thing. Of course, once we go to Mars to stay, we’re not going to want to bring our food; obviously you can’t if you go just to stay. SS:You can’t grow anything there, right? SS:What is the temperature there? RZ: The temperature in the daytime gets up to about 10 or 15 C, which is fine. At night it gets much colder – minus 90. So, you want to stay inside at night. You have to heat the greenhouse but heating greenhouses is hardly beyond our technology. We can grow plants in the greenhouses, we’ve got the water, we’ve got the carbon dioxide, the kind of nutrients that plants need are in the soil. We’ll be able to grow plants on Mars, we’ll be able to, as I said, get water. There is geothermally heated water deep underground and we can actually extract power from that. All the materials needed for industry are present on Mars. For instance, iron is extremely abundant that’s why the planet is red. But there is also silicon, aluminum, titanium, sulfur, phosphorus and so forth. In fact, if go to Mars, we can develop the craft of how to use these different materials on Mars and turn the materials into useful substances: how to make metals, glass, ceramics, plastics, wires, tubes, habitats… We can become self-sufficient there. SS:But what you’re just describing is a life of such hardship. Why would anyone want to do that? Why can’t you just live on your beautiful Earth where you have seas and oceans, and you have green trees, and birds flying around, and food that grows in soil? RZ: Well, that’s fine. But there is going to be… always going to be people that want to go places with rules that haven’t been written yet, an open frontier: a place where they have a chance to make their own world instead of just living in one that has already been made for them. And that’s a fundamental kind of freedom, and that’s what having an open frontier means. SS:What’s going to happen with the frontiers? Do you think people who will colonize Mars should have frontiers? They should set up borders or should they live in just one big community, living together happily? RZ: The word ‘frontier’ means something different to the Americans than it means for the Europeans. Frenchmen will describe the border with Germany as a frontier, no American would think of that border as a frontier. To Americans ‘a frontier’ is the boundary of the known beyond which is the unknown. For many Americans the idea of having a frontier, is a place where you can go beyond into the undefined and create – this is something extremely desirable. The famous historian, Walter Prescott Webb, wrote a book called “The Great Frontier” in which he says people will miss the frontier more than words can ever express. And they do! I think that’s why the space program has that kind of support from Americans that it does, because we view space as the final frontier. And they even talked about space as the new frontier and it is! And to have a place where the rules haven’t been written yet, to be able to define a new future in a new place, this is very a liberating thing and it’s worth risking life and fortune to have. SS:I’m still thinking we could spend all that money to save our planet that we’re living on to make it greener, to make it safer, to make it a better place to live. Why spend all this money on Mars while we haven’t even taken care of our planet yet? What makes you think that it will work out there if it’s hardly working out here? Why just not make our planet a better place instead of going and colonizing Mars? RZ: Well, there are many useful things waiting to be done on Earth. I think that having a ‘humans-to-Mars’ program will encourage so many young people to go into science and engineering as Apollo did in the United States, and that out of that intellectual capital we’ll get all kinds of new inventions that don’t just bear on space but bear on every aspect of human existence that advances the economy, that advances public health itself and these environmental problems you talked about. But I also think that we’re also doing a bunch of things on Earth that we’re better off not doing. Frankly, I think we would be a lot better off with people spending more time thinking about how to get to Mars and less time thinking about how to get the upper-hand in Syria. SS:But won’t they be doing the same things on Mars if they colonize Mars? The vices go everywhere with human beings. It’s not like they are going to forget about their head and brain once they go to Mars. SS:Are there going to be borders? Is there going to be one currency, one language, many languages? Is it going to be just one flag? Americans colonized Mars, so it’s American? SS:So you can conceive on Mars? RZ: I see no reason, why not? Why people can’t give birth…of course you can. SS:It’s quite interesting because obviously most of the people who think other planets should be colonized, they think that because the Earth is becoming overpopulated, but your reasons are completely ulterior - they envisage invigorating human faculty. Give me a larger picture of how you see Mars as a colonized planet by humans. RZ: Well, I see new societies there and they will be new; they’ll take their initial traditions from those that went there first. So, someone will read Mark Twain and someone will read Pushkin. SS:So they will be in touch with Earth? SS:The way you talk about it is fascinating, and you’re obviously very passionate about it. Are you going to be a part of that? I mean would you like to go to Mars? RZ: I’d love to go to Mars. I don’t think I’m going to have a chance. RZ: Well, because I’m already 61 years old and we’re talking about the first missions going ten years from now and colonization missions going after that. I think it could have been that I could have gone to Mars – I was 17 when we landed on the Moon. If we had kept going the way we were going then we would’ve been on Mars by 1981, but we had a massive failure of leadership in the United States. The Nixon administration canceled the program even as we were landing on the Moon. It was like Columbus coming back from the new world and Ferdinand and Isabella saying, “So what, who cares?” We walked away from accomplishment there, but I think we should pick it up again. Once again, I’m very much for America going to Mars. I’m very proud to be an American. I want America to have its stamp on the future, on the new world but I don’t think that we should be the only ones. I think other countries also deserve to have their stamp on the new world, and I think Russia should be one of them. SS:Really briefly, because we’re out of time. You said that Russia and America should work on this together, but if you look back to the 60’s and the 70’s, it’s the rivalry between the Soviets and the Americans that actually helped advance the Lunar and the Martian programs. RZ: Well, if you want to work together by competing, if you want to work together in a kind of friendly Olympic competition – that’s fine too. But whether we do it as one program or as two programs that are friendly rivals driving each one’s accomplishment further by our own accomplishments, either way is fine. There is a brotherhood in either way. I think this would be a very good thing. You know, right now there is a little chill going on in Russian-American relations; I think we should turn this around, this is not a trend that we want to see go forward. I think we should turn it around. I think we want to have a world of friendship, and by working together on the project just great as this, I think we can help forth with that. SS:All right. Let’s hope that we’ll colonize Mars together. Thank you very much for this interesting interview, Robert. That’s it for today - this edition of Sophie&Co is over. 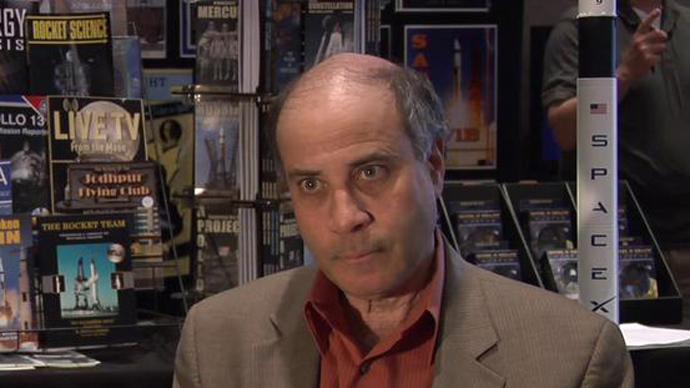 Our guest was Robert Zubrin, American aerospace engineer. Thanks for watching, we’ll see you next time.